Jazz Profiles: Paul Desmond - "Summertime"
The year was 1968 [I know, I know - “The Summer of Love” and all that jive]. I was back in the world of music in a big way with lots of casuals and some club dates coming my way. [Believe it or not, there were still some Jazz clubs in existence in southern California in 1968 - barely]. One of the groups I was regularly working with focused on Latin Jazz with a particular emphasis on Bossa Nova [Think Sergio Mendes, but with a hip, slick and cool twist]. I was getting very tired of playing the basic bossa nova beat - a clave derivative with a samba inflection - the idea being to cool down the traditional samba beat and make it less like a marching band cadence and more like the softer Jazz drumming of the West Coast Jazz cats like Chico Hamilton and Shelly Manne. So I started digging around for licks, kicks and rhythmic inflections that would keep the basic bossa nova “feel” but also make it interesting and challenging to play. There were no drum books on the subject of bossa nova drumming in 1968; no videos either. 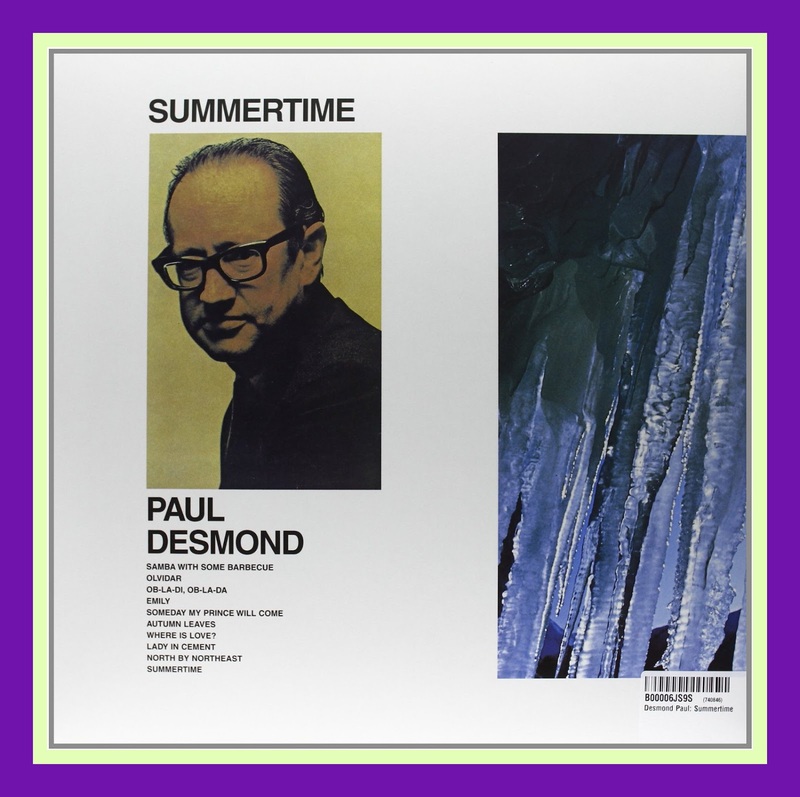 Enter Paul Desmond's Summertime [A &M 3015] as Leo Morris appears on five of the album’s ten tracks. To put it mildly, Leo plays some of the best bossa nova beats this side of Airto Moriera, the monster Brazilian percussionist who just so happens to be on the other tracks on Summertime [A&M 3015] on which Leo doesn't appear. The trick with bossa nova is that you have to keep the “feel” light and airy; you can’t step on it or overplay. You have to make the rhythm float. You also have to simulate the complexity of a Samba rhythm section with its bells, gourds, and whistles so as to add “texture” to the music. Leo Morris does this in a variety of ways from double pumping his bass drum with a light eighth note feel while making the sound of that drum into a light thud; using a heavy ride cymbal to get more of a pinging sound and thus reducing the normal overtones or whooshing sound; using a dishy crash cymbal for accents along with light crashes from the hi-hat cymbal that are formed when the left foot doesn’t close the cymbals all the way [i.e., instead of the usual clicking sound]. Drummers listen to music in a different way because they are not distracted by the usual requirements of melody and harmony. Their job is to establish and push the pulse or beat of the music, the metronomic insistence that makes Jazz what it is. But they are also the source of the music’s rhythmic excitement and playing the same thing over and over again is not particularly exciting. 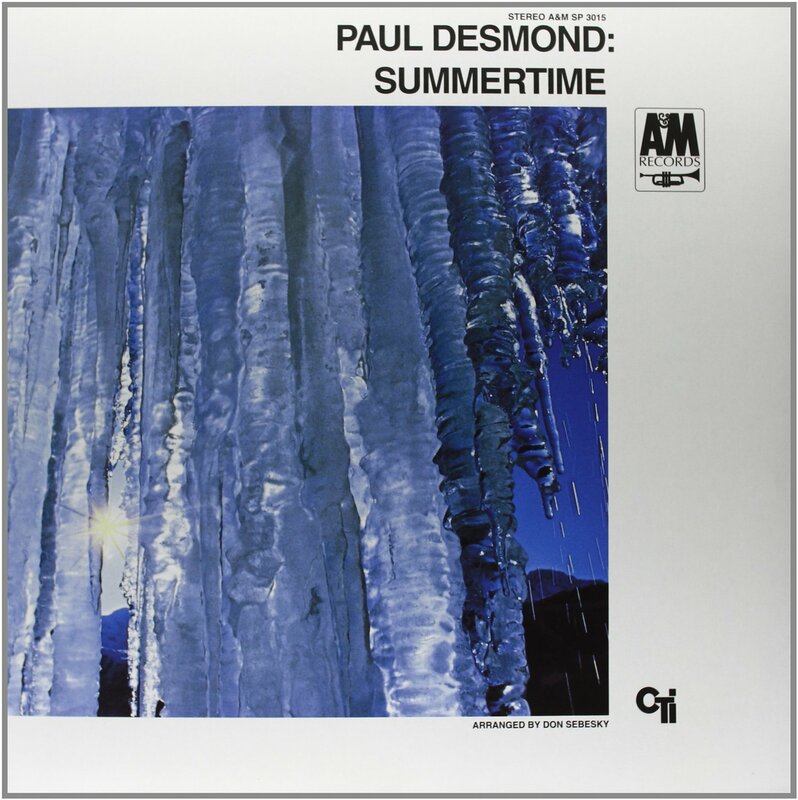 Thanks to Susumu Murakoshi, this piece concludes with a YouTube video that includes all ten tracks of Paul Desmond’s Summertime [How he escaped the wrath of the Copyright Gods and was able to accomplish this feat is beyond me.]. Listen closely to the first track Samba with Some Barbecue to hear the ultimate in bossa nova drumming excitement as Leo Morris lays down a stunning array rhythmic accents that employ many aspects of the drum kit to generate a positively propulsive bossa nova beat. As a point in passing, Richard Cook and Brian Morton in their always informative Penguin Guide to Jazz on CD 6th Ed. assert that "Paul Desmond never made a recording on his own account with a pianist other than Dave Brubeck." I guess Herbie Hancock's appearance on 8 of the 10 tracks on Desmond's Summertime [A&M 3015] somehow don't figure into this assessment? For the most part, Eugene Boe’s original LP liner notes are fun to read and even occasionally helpful [he said in a somewhat snide manner!]. But the reviews of the recording by Steve Voce in JazzJournal and Dan Morgenstern in Downbeat provide the Jazz fan with more relevant insights into Paul’s special qualities as a player and the many good things that make Summertime [A&M 3015] a special recording. “When the Dave Brubeck Quartet called it a set at the end of 1967, Paul Desmond decided it was high time for Time Out And rightly so, After all, he had been with the quartet since "before the Crimean War" (factually, 17 years), logged a million-plus miles in air travel, cut 50 or so LP's and played in as many countries, and was plain bushed. For nine months he never laid lips on an alto sax. Four of those months he whiled away pleasantly in a rented house in Montego Bay, There he conceived the idea and set down the first jottings for a book of reminiscences- a book tentatively titled "How Many Are There In Your Quartet?" It was a question Paul and his colleagues had learned to live with, since it was put to them so sweetly- and so often!- by airline stewardesses. Summertime is Paul's first post-Brubeck reading and it was quite an experience. "Being in a fur-lined jet cocoon all those years," he recalls, "I had never been around New York really long enough to play with other musicians. Then to walk into a recording studio and have everything work so beautifully. Ron Carter (bass) and Herbie Hancock (piano) are both geniuses and incredibly easy to work with, The same goes for Airto Moreira, the Brazilian percussion player,"
Louis Armstrong might have to listen twice to recognise his Struttin' With Some Barbecue, which he wrote way back in 1941 [Mr. Boe is incorrect as Struttin’ With Some Barbecue was written by Lil Hardin Armstrong and recorded by Louis Armstrong and his Hot Seven in December, 1927.]. In 1969, Struttin's lost its Dixie beat (but not its melody) and gone the Brazilian route. It moves along with a lively, lyrical gait, Arranger Sebesky doubles as composer in Olvidar, a lovely haunter that sets Desmond way up there in a slow, dreamy remembrance of things past- you have to allow even this engagingly self-deprecating sax player his vanity. Listening to the tapes of the latest Beatles album, he gave his best hearing to those lyrics that begin, "Desmond had a barrow in the marketplace". But Ob-La-Di, Ob-La-Da also presented the challenge of how to record - and make interesting - a simple monotonous song whose very monotony is its chief fascination. The result is a sassy, infectious Calypso-type tune which seems to have been appropriated by a transistorised Brazilian street marching band And it's Carnival time, of course. "Ob-La-Di, Ob-La-Da, life goes on, bra lala"
“Desmond's first recorded outing since leaving Brubeck was worth waiting for. During his long tenure with the pianist, Desmond often recorded on his own, but rarely have his talents been more tellingly displayed. The personnel list looks gigantic, but represents six different sessions; in fact, Don Sebesky's scoring is discrete, and for long stretches, Desmond is backed by rhythm only, often in a bossa nova groove. Varied and often interesting material, a recording quality that beautifully captures and projects the altoist's sound, and the sympathetic backing he receives-from Hancock, Carter and Beck in particular- help carry the album, but it is Desmond's consistent excellence that holds it up. backhanded compliment; the ploy was to praise Desmond at Brubeck's expense. This was unfair to both. Desmond wasn't just mainly responsible for the musical interest the famous quartet held for anti-Brubeckians. He was and is a very personal player of great sensitivity and musicality, with a rare sense of form and structure, and a real melodic gift. Desmond is too honest a player to be tempted by the relatively "commercial" setting he receives here. Some might consider his lyricism soft, but it isn't; though he is a gentle musician, his work has the inner strength that marks the genuine jazzman His distinctive sound has mellowed and ripened, as has his conception, and his playing here has a firmness and sureness that mark a new-found maturity. My favorite tracks are Where Is Love? and Emily for ballad beauty; the Beatles' Ob-La-Di for humour and swing (an apt quote from Hey Jude and a fleeting glimpse of Pete Brown are added attractions); North by Northwest for blues feeling (it ends with Audrey, another Desmond original), and, best of all, Struttin' With Some Barbecue, The Armstrong classic is ideally suited for bossa nova treatment, and the lovely arid still fresh melody gives Desmond something to play on. "Louis Armstrong might have to listen twice to recognize (his tune), which he wrote way back in 1941," says the liner note. It was way, way back in 1927, chum, the tune is credited to Lil Armstrong, and Pops would know it after two measures And like it for Desmond's graceful melodic flow. He might also enjoy the way Hancock picks up on Desmond's last solo phrase and builds his statement from it Barbecue is easy to like.